Crispy oven-baked avocado fries with cilantro lime dipping sauce! It’s football season! Woot woot! I’m more than a little excited. And only half of my excitement is for cheering on my Cougars. The other half is for the food. No doubt some of my favorite foods are the finger-eating kind. To a fault actually. I usually fill up on appetizers before the main course ever comes around. I think part of my preference for appetizers is due to my dipping-obsession. I’m a firm believer that everything is better smothered in sauce. 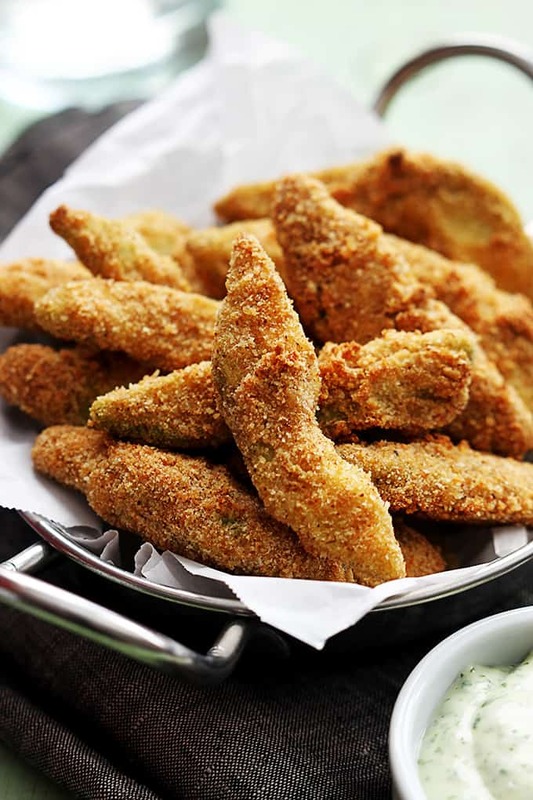 These avocado fries are no exception. I mean yeah, you could eat them plain, which I’ve actually done and quite enjoyed, but if you have two minutes (and you do, you really do) then you should whip up that really yummy cilantro lime dipping sauce you see above. It’s to-die-for good and cilantro-lime goes perfectly with avocado (hence the popularity of guacamole). And the fries themselves are so easy to make and crazy delicious! Bonus: they’re pretty healthy since you’re baking them instead of deep frying. You won’t miss all of that oil, promise! Preheat oven to 450 and grease a baking sheet with cooking spray. Add flour to a zip lock bag. Add avocado slices, seal, and shake to coat avocados in flour. In a small bowl whisk together eggs and water. In a separate bowl whisk together bread crumbs, garlic powder, chili powder, and salt. 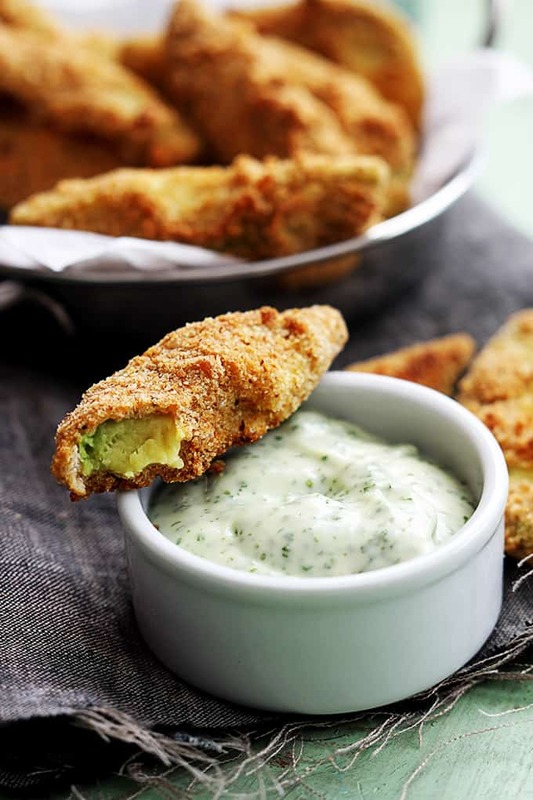 While avocado fries and baking, blend all sauce ingredients together. 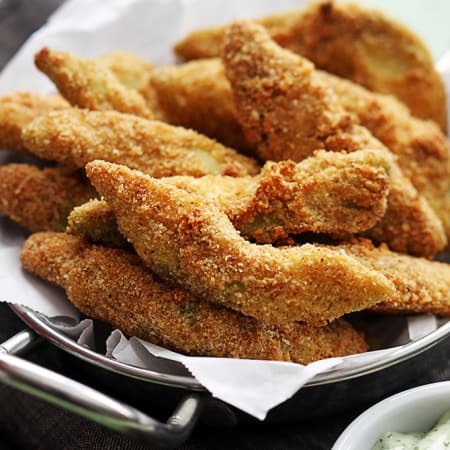 Serve avocado fries warm with dipping sauce. Enjoy! These look incredibly good! 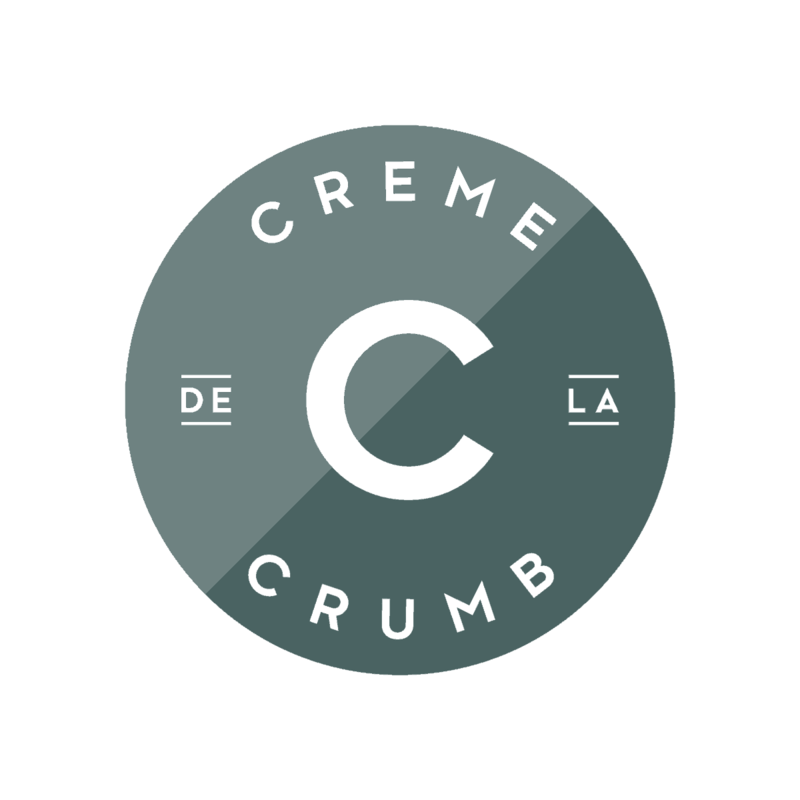 So happy to find a baked version – frying can get messy! Umm… yum! 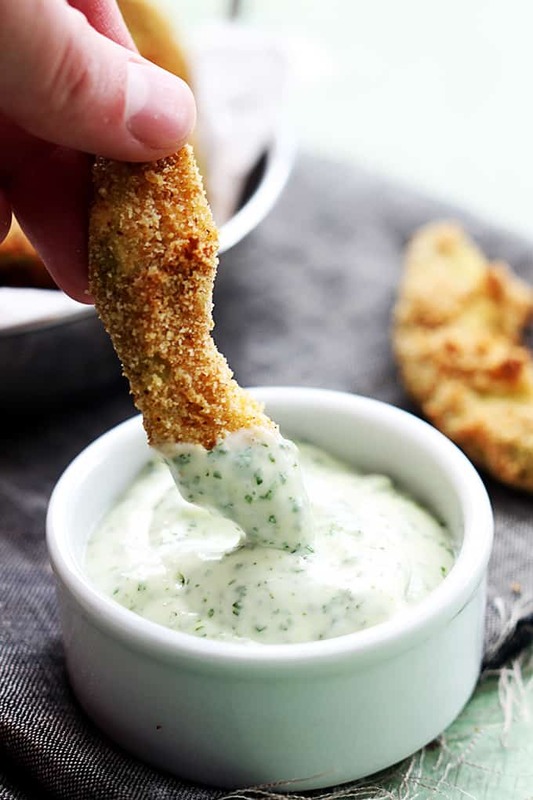 Avocado is awesome in and of instead but turn it into a fry and give it a rockstar dip. YUP! Ah-mazing! Yum!! This looks amazing! I love avocado but I’m yet to try fries! 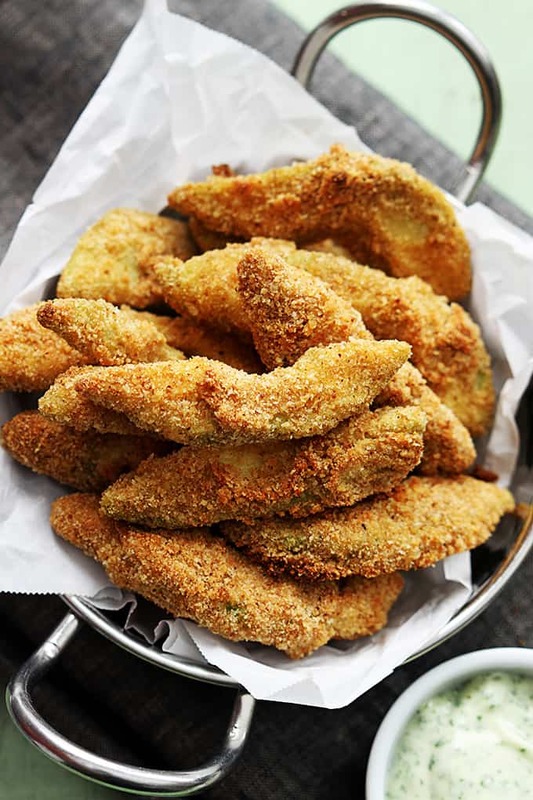 Until now it never occurred to me that you could make avocado fries! These fries look seriously crispy and delicious.. definitely need to know what they taste like. Making these as I typed. Have them in the oven…. We’ll see how they turn out because having the flour on the avocados first, my eggs were not sticking to the flour. I chose to use Panko breadcrumbs and those were hardly covering. I couldn’t get them to cover the entire thing well! :\ so we’ll see how it goes. I think next time I’ll skip the flour! Hi Breanna! Did you whisk the eggs first? When the eggs and water are whisked really well they should stick right to the flour-coated avocado slices! Hi! These look delicious but I was wondering what the texture was like. I love the taste of avocado but the texture grosses me out. If someone could describe the texture that would be great! Thank you! I feel the same! The soft goopy texture of avacado is a turn off. I made these with avacado from a bountiful basket. I was pleasantly surprised with the rough crispy texture. I’m still not a big fan of avacado but this Gave the flavor with none of the softness as. Crunchy and salty and the dipping sauce is a must! Don’t you love that sauce?? I agree – a must! So glad you liked these Lea!! I love your recipes! Now I know how to make those avocado fries I find in restaurants. Who’s trying to spend $10 on 5 fries?! Haha. Thank you for this! It’s so true – appetizers are SO over-priced!!! Hi there, thank you for the recipe! What is the purpose of shaking them in flour in the first step? My experience trying out your recipe led me to believe the egg wash has a hard time sticking to the flour, leading to some crumb-less spots overall, but it’s possible I did something wrong here. Thank you for the reply! Hi Alexandra, the flour actually helps the egg stick to the avocado and provides a bit of a “base” for the coating! How ripe do you recommend the avocado’s be for this recipe? Hi Beth! They should still be firm, definitely not too soft. Would this recipe work using an Air Fryer instead of oven? Are these photos made by you? beautiful! They are! All the photos here on this website are my own. Thank you!